dotdigital Engagement Cloud Reviews Recently Reviewed! Overall: We were able to send out more emails due to the easy use of the software. Wish other things were improved. Pros: Full-featured email platform at a cost lower than most competitors. Cons: Reporting could be improved. We can't figure out how to link to our Google Analytics account. 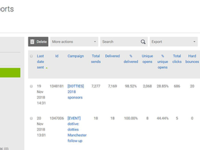 Overall: Dotmailer helped us send much more effective marketing campaign emails. Audience segmentation is easier than before. We're now sending personalized triggered campaigns to customers. Our transactional emails are now templated and much easier to update. Emails view better on mobile devices. Company was overall pleasant to work with through onboarding process. Pros: It works well if you are using Magento as your e-commerce platform. It is easy to use and the integration logic with Magento is very simple to execute. The package also comes with survey forms, SMS and ability to create landing pages. If you are new to email automation, this system may be a good start to get you familiar with logics and scheduling. Cons: The integration is nice to setup, however it may slow down the overall system. If you like to run various dynamic values, the system may give up (you will receive email from the admin if "your campaign has been cancelled"). The issue is there is no warning when you setup the logic if it may cause issue. It just happens when you set the schedule and let it runs. Another issue is the survey form only allows you to send the acknowledgment to 1 email address only. Lastly the system integration to other platform is not as fluid as to Magento . It claims if it works with Salesforce, Shopify etc. However they are limited on data integration and capabilities. Overall: If you are looking for a simple to use email automation system with Magento, it is probably one of the top choice. However if you are handy and like to create your own logic and unique segmentation from your email interaction, it may not be sophisticated enough. Overall: I was quickly able to build my skill in creation of emails, reach a wider audience, and push relevant content to the email list. Overall: Originally, we thought it was terrible. We wanted to quit and felt it was too expensive. Oddly - and by accident - we found where all of these people were signing up to subscribe to our newsletter and we didn't know it. We are small and reliant on one person to know how to do those things and it was eye opening for us. As soon as we figured out what was going on, both my husband and I began to play with it a little more and enjoyed coming up with campaigns and ideas. The power is really knowing the ins and outs of the application. Overall: This is the end all be all of email campaign management for my medium sized company. We use Dot Digital every single day to track our new leads and put them through our nurture cycle. I can whole heartedly say that without this platform my marketing team would be lost. If you are looking for a way to manage your address books and email campaigns this is where you should stop your search. Overall: Magento integration, segmentation and advanced subscriber targeting. Overall: The landing page builder makes it really easy to build nicely designed landing pages that helps our lead generation campaigns. 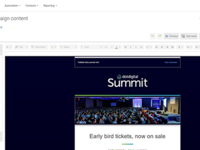 We are utilizing DotMailer to market to the emails we gather at events which we were unable to reach before. Overall: for basic blast campaigns it works fine and integrates pretty easily with Magento. Overall: Dotmailer used to be great software, leading the way with WYSIWYG editors and simple automation and segmentation tools. Over the past 2-3 years, others have caught up and overtaken Dotmailer. Their response is to focus on large companies with big budgets, as a result of which they have priced themselves out of the market for smaller businesses. When dealing with anyone except tech support, the attitude is often extremely arrogant and unhelpful. There's other software available that does the same thing, with better support. Overall: Coming from an almost zero experience with email marketing, engaging Dotmailer has helped us see our best growth year to date. Overall: dotmailer is a great platform that allows for some powerful means of mass messaging/emailing. It took my company quite some time to get onboarded because of the degree of difficulty in setting up the automated campaigns. It would be highly recommended if the interface was cleaned up a bit and the overall UX was better. Pros: The user interface is simple to use and offers a great user experience when building email campaigns. 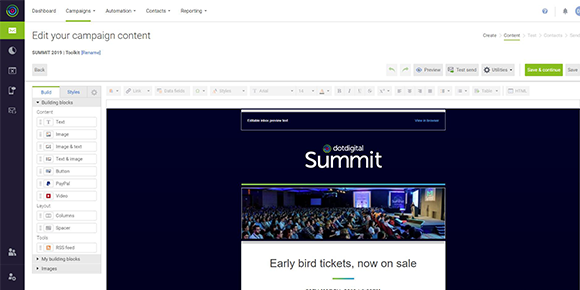 The tools provided to build email campaigns make those of us without a design background look like a genius. The drag and drop features make building custom templates a breeze. The simplicity of the interface shouldn't distract from the powerful software that allows for automation email programs. The customer service is second to none. A top notch support team quickly identifies and resolves any issues. Our customer success manager analyzes our campaigns and provides helpful insights to make each one more effective. Overall Dotmailer is an extremely user friendly platform. It also helps that their team is helpful! Pros: The drag and drop ability. 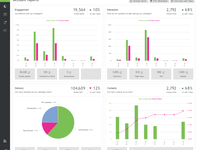 and the analytics dashboard. Those two features make building emails and analyzing data super easy. Cons: I wish we had the ability to add multiple links to one image. Being that I work for a makeup company, we push images of models wearing makeup. It would be nice if I could have the lips of the model link to lipsticks and the brows to push to our eyebrow products etc. Overall: The Marketing Automation program has been amazing in building our email subscriber list over the past year! Easy to use with great support. Pros: It's intuitive and powerful. I can build an automated program to do anything I can imagine with my contacts. The only limits are within the quality of my own data or imagination. If I'm ever stuck on what to do I can get a knowledgable rep on chat within seconds to help. Cons: The integration with Magento 2.0 leaves something to be desired. It does not pull in sale prices (only MSRP) and it's glitchy to modify the product blocks that pull in dynamic content. Pros: This is a great application for building e-mails. It's so easy to drag and drop in codes and attachments. The preview feature is also amazing. I love knowing what my customers will see. That's a huge plus to getting their attention and looking professional also. The e-mail automation programs are a life-saver! I could go on for days! Cons: There are a couple features that are missing but I'm sure they will catch up and take care of that! Pros: Includes most features competitors offer but at a lower cost. GUI is straightforward and easy to learn. Good API support that works with our custom CRM. Customer support replies quickly and always seems knowledgeable. Online knowledgebase is comprehensive. Campaign reporting was recently improved. Cons: WYSIWYG email editor is sometimes cumbersome to use. Tracking sales results requires linking the account to Google Analytics, would prefer something built-in. Servers based in the UK caused some timestamp issues for our US-based business. Overall: Much better email personalization. Pros: I like the Overall Functionality. The best part is its Now dotmailers is a part of the Magento. As an ecommerce that is always a advantage to use the Inbuilt functions. Cons: Integration with other Software like Optionmonster and some other makes troubles. Overall: It is a great platform for mid-market eCommerce companies, or even non-eCommerce companies that are looking for a more advanced feature set, such as automation, integration with platforms like Magento, Shopify, and BigCommerce. It is comparable to a Klaviyo platform. Pros: Its drag and drop feature is very helpful, also saving templates is another feature i like about the program. Cons: reporting are to general, i wish the report could be seen by a specific time frame, this helps check how our users react to our emails in the long run. Pros: Dotmailer features are very competitive and their pricing model is better than those in the competitive landscape. Cons: The training videos could be better. Platform enhancements often occur without notification or detailed instruction. Support is good. Pros: Amazing features and functionality like split testing, geolocation reports, dynamic content and easy to use templates. Cons: It is expensive when you start integrating the product with your own CRM system as you have to pay a separate synching fee. Pros: The main purpose for looking into dotmailer was the integration with Magento This was the main email marketing platform that seemed to work best with our needs with Magento and Salesforce. The implementation team was excellent in their support and testing between both applications and I had complete confidence in their ability! Cons: Very little to dislike. Would just like the ability to select a campaign to work on and not always have to choose that campaign everytime I work on emails in that campaign. Seems an easy default to add. Best i've used, but does need some updating. Pros: Super easy to use. Love how I can add as many images as I need. Great ability to edit the images inside of dotmailer. Cons: Need better feedback on bounces and then a solution on how we can fix those. Spam check should be included in price too. Pros: Ease of use and Preview functions. The editor's drag and drop function is quick and easy to assemble a campaign from scratch. The in-program image editor allows for quick resizing and tweaking of individual images, without the need to export to an external program and re-import the re-edited image. Customer support has been great! Cons: Limited font point sizes (without going into the html code). There is no place to add notes or comments about a campaign when sending a test to someone. Overall: It made creating email campaigns much easier. Dotmailer does a great job! Pros: The ease of use if what I like the most about the software. I can build a campiagn quickly and easily. Cons: I would like it if the learning curve for the automation was a bit smaller. It took me awhile to get the hang of how the design feature works. Overall: I use Dotmailer to stay in contact with our clients current and new. I love using the automation feature to get our surveys out with out several steps. Pros: It is very easy to use... just drag and drop. The pre-done work flows help out a lot when trying to set up new triggered emails. Cons: You are not able to add in a background image, the emails sent out look boxy and not modern. The only way to accomplish a modern design it to create images of the whole email that ultimately gets put in the junk bin due to the amount of images. Pros: It is easy to use, customer support is fantastic, I have a meeting every Tuesday morning to make sure I am getting the most out of the platform. Our company can now have the marketing feel of a bigger company that is helping us grow. Overall: It is great, I have a connector from Magento to Dotmailer, it then allows me to use that data in ways I could not manage if I had to try to do it manually. Pros: The software is easy to use and the drop and drag features make this simple for anyone to learn. I can create a new template in minutes. Cons: Not much to be honest. I have not had any issues with it so can't really say anything negative. 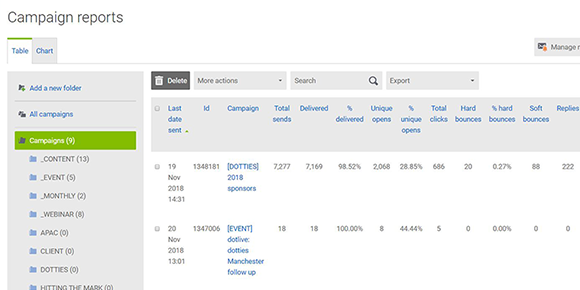 Overall: Dotmailer has enabled us to connect our CRM system with our webstore (magento) tool. It has made segmenting easy and seemless. Love it! Pros: Mostly it's about customer service. Dotmailer has always met us halfway in being communicative and thorough with us when it comes to providing the solutions to our requests and helping us getting acclimated to the features. It's this kind of tailor-made customer service, that has allowed us to be able to become more acclimated with the system that has allowed us to reach to our constituents and corporate partners with some of the most professional and well-thought marketing campaigns I've seen in years. I also want to give a special tip of the hat to support team from dotmailer. ... So outdated that the only way it could run successfully was on classic Internet Explorer with ActiveX controls enabled. Meaning whenever had to be sent out, you will have to fire up a Windows 7 virtual machine that was solely used, to send out marketing emails. And in days when we were in a pinch, and something had to go out immediately, and there was not time to fire up the VM We had to code the email on sublime text, then copy/paste onto the editor itself Which was quite laborious. easy, exciting, valuable, and fun! Pros: The level of segmentation you can get down to is amazing and beneficial. Segmentation has proven to be a huge success for us in our emails. The program feature because you can set up many programs and and let them run right away with no hassle. With our past software, we had to manually send a lot of things including abandoned carts and review requests, and it was a long process. The integration of Magento is fantastic. Our dotmailer contact is very responsive and fast when we have questions--sometimes she answers within 3 minutes! That level of customer help is great. Cons: The logic behind the programs sometimes gets tricky to understand. Luckily our dotmailer rep can normally help with this. 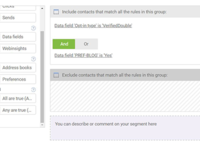 Simple and easy segmentation and no need to manually segment people in an excel sheet. Pros: We migrated to Dotmailer from Bronto late last year and the difference was immediately clear. Dotmailer provides a clean and organized user interface making it very intuitive and thus helpful for users, especially new users. I love the drag and drop email creation feature and this makes it easier for us to create our weekly newsletter as against having to create newsletters from scratch. The option to send sms to our contacts is an added bonus for Dotmailer. Cons: I sometime experience Lag on the Dotmailer website. Also when working on newsletters,it will be great for work to be autosaved,ensuring if I suddenly get disconnected from the internet ; I do not need to start all over again. Overall: We use Dotmailer to maintain a close relationship with our customers via emails,even when they are not currently patronizing us. Ensuring they will always have us in mind. 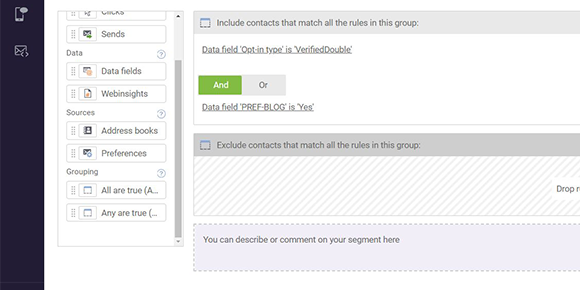 Pros: Dotmailer is very flexible and you will have a lot of options for your e-mail campaigns. Cons: The cost of course. Its not for everyone and especially if you have a large e-mail base. 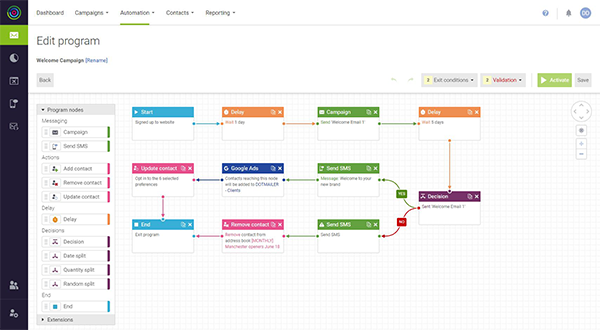 Dotmailer Allows Us To Automate Our Email Marketing Campaigns! Pros: We recently switched from another service to Dotmailer because it allowed us to connect it to our shopping cart and build automated programs that send emails out to users depending on certain criteria. We were able to easily build a program that monitors abandoned carts and post-purchase follow ups. Cons: It's rather expensive. Unfortunately we have a very large catalog so the cost to sync this data to Dotmailer is quite high. 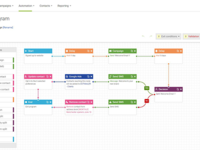 Overall: Automated email marketing campaigns. Pros: The UI is responsive, effective and looks great. The site gives good interaction feedback so we know where issues with campains might exist. Cons: The cost seems a bit high, but well within reason, and comparable to bronto in almost every way. Add a bit more value for cost and you did beat out bronto all day. Pros: I love the automation features. The more you use it, the more advanced and creative you can get. We have already tripled the amount of emails we send but decreased the work in 1/2. Cons: It does require a developer to implement into your site, do datafield building, and make sure your email code is clean. Dotmailer does have a creative team that can assist with email design for an added fee. Overall: The dotmailer team is exceptional. Really responsive and easy to work with. It has been enjoyable & looking forward to what's to come! I have really enjoyed using Dotmailer. It is very easy to use and the customer support is amazing. 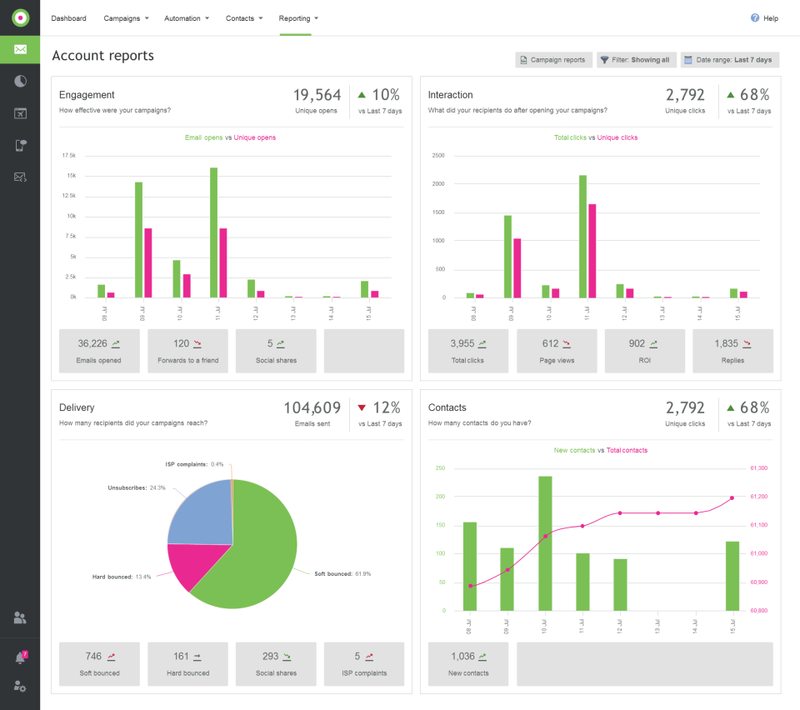 Pros: Definitely, the user-friendly aspect and the ability to pull detailed reporting on a triggered sent or an email. I also like the drag and drop automation builder - very user-friendly and intuitive. One of the best thing though really is the customer service. I have asked countless questions and have always gotten a response immediately - something that other ESPS I have worked with don't have and it really is a problem and can be frustrating especially when something is going wrong in the moment. Cons: I wish when sending AB tests I could send the test to 100% of people instead of just sending to 60% or less. I also would like to be able to glean more information than just opens and clicks for Transactional emails. Overall: Data, tons of data and the ability to segment.